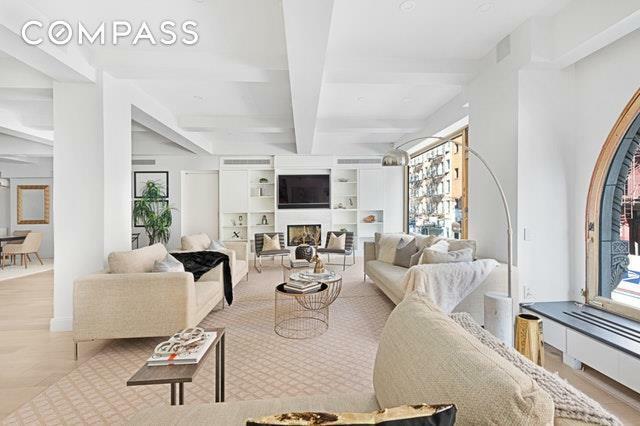 A palatial home in the midst of New Yorks most dynamic neighborhood awaits. 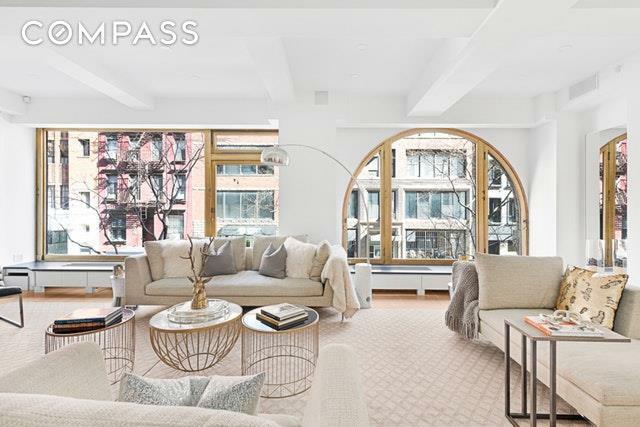 This stunning prewar residence exceeds 4,200 square feet of living space within one of Chelseas iconic buildings. Modern interiors coupled with magnificent architectural details are a perfect marriage in this expansive home. Enter through a generous gallery and leave the city at the door. 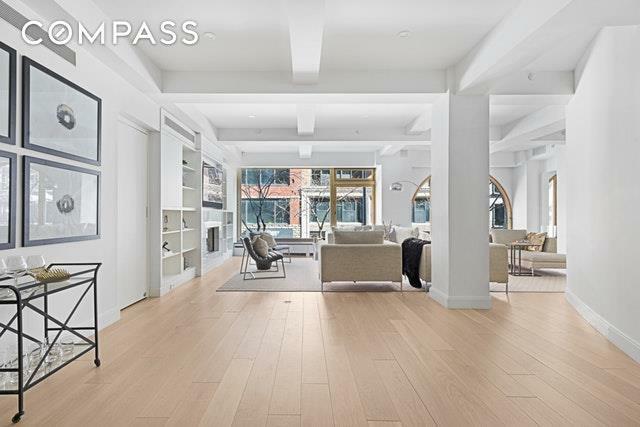 As you wrap around gallery, youll find one of Chelsea's largest private entertaining spaces. The massive modern chefs kitchen is an entertainers delight with a large Carrera marble island, custom millwork and storage above and below. With a Wolfe range, pot filler faucet, additional Wolfe Oven, Sub-Zero refrigerator, two Sub-Zero refrigerated drawers, two Miele dishwashers, two wine refrigerators and two sinks, there can never be too many cooks in the kitchen. Across from the kitchen is a dining room that accommodates 12 guests or more. Immediately adjacent to the kitchen and dining quarters, is the voluminous Great Room with 11 foot ceilings, fireplace and custom built ins. The two massive bronze encased windows are from a bygone era and allow light to billow into this impressive entertaining space. The possibilities are endless for the large Great Room, whether you want multiple seating areas, a grand piano or a billiards room, the only limit is your imagination. The spacious master suite has a fireplace, large walk-in-closet and beautifully renovated, zen inspired five fixture master bathroom. There are two other generously proportioned bedrooms with ensuite bathrooms that are large enough to be master bedrooms in any other building. In addition to these bedrooms, find a large home office / sleeping area with its own ensuite bathroom through handsome custom casement doors. This room can be utilized as an office, bedroom, library or screening / music room. With brand new 5 inch wide oak hardwood floors, character laden 11 foot beamed ceilings, a separate laundry room with Bosch washer & dryer and endless storage, this can be your forever home. The Capitol Building is a gorgeous boutique prewar residence constructed in 1926. The full-time superintendent delivers the morning newspapers and receives packages. Enjoy the beautiful roof deck while taking in brilliant NYC views. Conveniently located near Whole Foods, Trader Joe's and Fairway Market, subways (1, C/E, F/M), incredible restaurants, galleries, gyms and shopping. This incredibly flexible coop permits immediate unlimited sublets, live/work, investors, foreign buyers, pied-a-terres, co-purchasing, gifting, guarantors and pets! 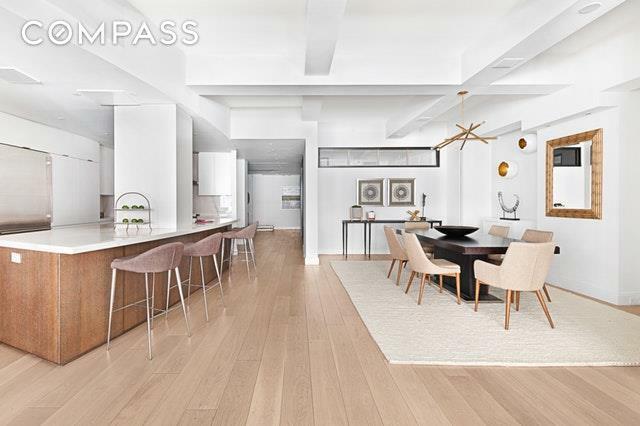 Listing courtesy of Aaron Mazor of Compass.